India's MC Mary Kom (35-year) defeated Hanna Okhota (Ukraine) by 5-0 in the 48kg light flyweight to clinch an unprecedented 6th gold medal at the women’s World Championships in New Delhi. Now, Mary Kom has become the first female boxer to win six gold medals at world championships. Mary Kom had won gold in 2002, 2005, 2006, 2008 and 2010 editions of the Women's World Boxing Championship and was tied at five gold medals with Katie Taylor of Ireland. 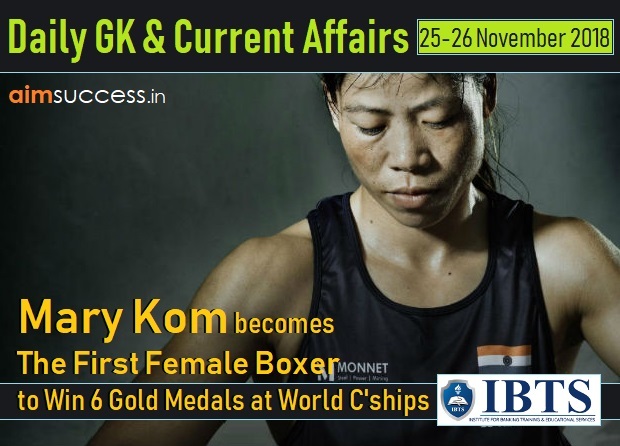 Now, Mary Kom matched Cuba's Felix Savon as the joint most successful boxer (men and women) in the World Championships history. India finished with one gold, one silver (Sonia Chahal) and two bronze medals (Simranjit Kaur and Lovlina Borgohain). The AIBA Women's World Boxing Championships are biennial amateur boxing competitions organised by the International Boxing Association (AIBA). A selection panel of ICC has picked up the team based on the players' performances in the tournament. India's Bhavani Devi (first Indian) has won the gold medal in the Sabre event in the Senior Commonwealth Fencing Championship 2018 in Canberra, Australia. She defeated England's Emily Ruaux 15-12 in the final. Ace Indian shuttler Sameer Verma has clinched the Men's Singles title of Syed Modi International Badminton Championships against Guangzu Lu (China), to retain the title. With this win, Verma sealed his spot in the BWF World Tour Finals. Men’s doubles pair of Satwik Rankireddy and Chirag Shetty and women’s doubles players Ashwini Ponnappa and Sikki Reddy also settled for silver in their respective finals. Australia has lifted the Women's World Twenty-20 title for the fourth time at Antigua. In the title clash, the Aussies recorded an emphatic 8-wicket win over England. Australia bundled out England for just 105 and then with the bat, Australia overhauled the target in just 15.1 overs with 8 wickets in hand. Ashleigh Gardner (Australia) was the player of the match. The National Milk Day (NMD) has been observed on 26th November across India to mark the birth anniversary of the Father of the White Revolution Dr. Verghese Kurien. The idea of observing National Milk Day was first mooted by Indian Dairy Association (IDA) in 2014 on the lines of World Milk Day that is observed on 1st June every year under the aegis of UN Food and Agriculture Organization (FAO). Dr. Kurien he was conferred with many accolades such as Ramon Magsaysay Award, Padma Shri, Padma Bhushan, Krishi Ratna, World Food Prize, Padma Vibhushan, etc. He was also given 15 honorary doctorates from various universities from across the world. Dr. Verghese Kurien is also known as the Milkman of India and the architect of Operation Flood. Dr Kurien was born into an affluent Syrian Christian family in Calicut. The Constitution Day in India is being celebrated every year on 26th of November. The constitution of India (supreme law of India) was adopted by the Constituent Assembly on 26th of November 1949 and came into force on 26th January in 1950. The constitution (longest written constitution of any country) replaced the Government of India Act, 1935 as the country's fundamental governing document, and the Dominion of India became the Republic of India. The Chairman of the drafting committee ‘B. R. Ambedkar’ is widely considered to be the chief architect of Indian Constitution. The Constitution empowers the people as much as the people empower the Constitution. Former Railway Minister, senior most Congress leader CK Jaffer Sharief (85-year) passed away at a hospital in Bengaluru. He held the office of the Minister of Railways under PV Narasimha Rao (from 1991 to 1995). Sharief served eight terms as the member of parliament, the last of which was from 1999 to 2000. Jaffer Sharief was born in Chitradurga district of Mysore kingdom (now Karnataka). The United Nations (UN) has selected Uttar Pradesh's Noida and Greater Noida to participate in its Global Sustainable Cities 2025 initiative. The twin-cities in Gautam Buddh Nagar district, adjoining the national capital, have been selected in the "University City" category ahead of Mumbai and Bengaluru as the only invitee from India. Overall 25 cities across the world have been selected in five categories by the UN Global Sustainable Development Goals (SDG) cities initiative. The SDGs are a universal call to action to end poverty, protect the planet and ensure that all people enjoy peace and prosperity. Andhra Pradesh Government has launched ‘Bhuseva’ and ‘Bhudaar’ web portal through which people can view land records online. People can get land record online through these portals using Aadhaar card. The Bhudaar security policy was also launched to provide security to the land records of farmers. The Bhudaar card can be generated by the landowner or property owner from Bhuseva web portal. Two types of Bhudaar cards are available including e-Bhudaar and M-Bhudaar. To increase transparency and build transport solutions, the transport department of the Delhi government has launched the Open Transit Data platform which provides real-time datasets free of cost. It is a major step to promote collaboration and co-creation of innovative and inclusive transport solutions for the people of Delhi. Bihar Chief Minister Nitish Kumar unveiled a 70-feet tall statue of Lord Buddha (made of pink sandstone) at Rajgir in Nalanda district, Bihar. It is the second tallest statue of Buddha in the country. The statue has been installed above a 16-metre radius pedestal in the middle of Lake Ghora Katora. Bollywood superstar Amitabh Bachchan has been awarded the third Sayaji Ratna Award for contribution to social causes. Earlier, N R Narayana Murthy (Infosys co-founder) and Ratan Tata (noted industrialist) have been given the award earlier. In 2013, The Baroda Management Association had instituted the award to mark the 150th birth anniversary of the ruler, known for undertaking major social reform measures during his rule in the early twentieth century. Popular singer 17-year-old ‘Nahid Afrin’ (from Assam) has been appointed as the first 'Youth Advocate' of the northeastern region by the UNICEF (United Nations International Children’s Emergency Fund (UNICEF) to fight for child rights. The UNICEF engages 'Youth Advocates' to harness their voice as agents of change in society. Nahid made her playback debut in the 2016 Bollywood film 'Akira' starring Sonakshi Sinha in the lead. She received the best female playback singer award at the Assam state Film Award 2018. GK Quiz (for previous day’s news only) Take the quiz below to find out how well-versed you are in current affairs. You can also go through the Daily GK Update: 23-24th November 2018 before attempting the quiz. Read Daily GK Update of the 23-24th November 2018 here.